A group playing Saturday in the Golf Channel Amateur Tour completes its round on 18th hole at Maderas Golf Club. One of the major stops on the Golf Channel Amateur Tour is this weekend’s San Diego Open. 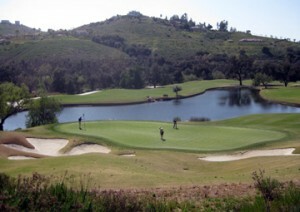 It’s a two-day, 36-hole event played at Maderas Golf Club and Rancho Bernardo Inn. There are 21 states represented in the 180-man field, which is divided by handicap into 12 flights. Seemingly all of the visitors came here in search of some sun. Saxon, 41, owns a business called Sandia Hearing Aids and said he signed up for the Tour because he found himself spending too much time working. “I joined to get me back into golf and get my handicap down,” said Saxon, who plays to a 15 handicap. He shot a 98 on the par-72, 6,555-yard Johnny Miller-designed course at Maderas. He felt fortunate to avoid triple digits after shooting 54 on the front. Saxon put the driver away on the back nine and carded a 44. Saxon called Maderas one of the most difficult and challenging courses he’s ever played. It’s certainly much different than what he sees back home in New Mexico. There were the narrow fairways and some blind shots. There were the canyon holes that created some difficulty judging distance. And there’s the price to be paid for leaving shots short — or long. Moore, 61, who also was eager to get out of the Colorado cold. Now if he could just get his game to warm up. Moore, a 22-handicap, failed to break 100 at Maderas. He should fare better Sunday at Rancho Bernardo Inn, where errant shots have more room to roam. Brushett shot an 88 at RB Inn on Saturday, then came over to Maderas to get another look at the course before playing it on Sunday. He shot 85 at Maderas in a practice round earlier in the week. “You play for bogeys and if you pepper in some pars it’s a good day,” said Brushett, 43, an executive who joined the Tour two years ago and is playing in his 20th Golf Channel event. The lowest score of the day was a 2-over-par 74 by Roland Rivera of San Diego in the Championship flight, which includes golfers with handicaps of 3.9 or lower. It was one of 20 scores in the 70s at RB Inn, where most of the lower-handicap flights played on Saturday. They move to Maderas for Sunday’s final round. Rick Labrum of Murrieta, playing in the Senior Hogan flight (handicaps of 8 to 12), had the lowest score at Maderas on Saturday with a 10-over 82. Here’s more on the Golf Channel Amateur Tour. This entry was posted in Attractions, Golf & Sports, Insider Tips, San Diego Events and tagged golf, Golf Channel Amateur Tour, Maderas Golf Club, north county, Rancho Bernardo Inn, San Diego Open by Kirk. Bookmark the permalink. I first gripped a baseball at the age of six. The game has had its grip on me ever since. I enjoy watching and writing about Little League, high school and college as much or more as the major leagues. I would be consumed by golf if it wasn’t for this voice in my head whispering “pay the mortgage, pay the mortgage, pay the mortgage.” I enjoying reading a good book, but I’m more likely to watch a good movie. I was born and raised in San Diego. If not, I’m sure I would have moved here. I’d join three of my buddies at sunrise in the first group off the tee at Torrey Pines, then head up the coast a few miles to enjoy Mexican food for lunch at Las Olas in Cardiff. We’d drop down to Del Mar after that, grab our Boogie boards (waiting an hour after eating, of course, before going in the water) and catch a few waves, then wash off the sand and head downtown to Petco Park to catch a Padres game. There’s no way to pick just one. It doesn’t get much better here than playing a round of golf — especially a twilight round where the last putt falls just as the sun sets — because you can do it year-round. My wife and I also enjoy kayaking on Mission Bay or riding bikes along Crown Point Shores. Burger and a beer. Make that a root beer. Nothing beats Mug Old Fashioned poured over two scoops of vanilla ice cream.